Installing simple, small-scale networks to provide drinking water to villages or small towns in rural areas far away from urban mains. 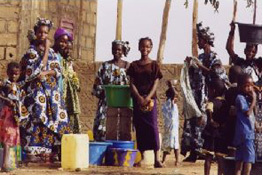 In rural areas, the long distances between lodgings and water sources constitute a problem for local populations. An individual needs at least 20 l of water per day to meet their daily needs. However, in some areas, people have to walk several kilometres to find a source of potable water. This has negative impacts on health since being so far from clean water encourages people to use water from closer sources that is perhaps not as clean, leading to cases of water-born illnesses (diarrhoea, cholera, dysentery, etc.). At the same time it has a negative impact on children’s schooling because they are often responsible for fetching water, carrying heavy loads and taking much time out of their day to travel the long distances. Providing permanent access to drinking water then is an important factor in improving the living conditions and health of these populations, while also allowing children to attend school more regularly and saving women the several hours that fetching water can take them. This technique is particularly adapted to rural areas or zones just outside urban areas where there is a high population density but that is far away from adequate water network infrastructures. This technique consists of building all the installations for water adduction, simplified treatment if necessary and distribution but on a small-scale in a village or mid-sized community, using simplified standards and infrastructures that make the set up easier to achieve and less costly. The purpose of this component is to gather water from the water table either by collecting it at a spring, or by drilling fairly deeply and using a pump. A spring is an upwelling of the water table, which can be local and shallow (that is the easiest) or diffuse and deep (in this case, it will be necessary to plan the drainage so as to capture as many streams of water as possible in a well or a seepage spring box). Water is then fed into the network either using the force of gravity or with the help of a motor-driven or solar-powered pump. In order to keep the water clean and of good quality, a preservation area should be set up around the source. If a well is drilled, water is taken from the drilled hole which reaches down to the water table (sometimes more than 100 metres from the surface). An electrical pump is submerged in the water and it pumps water to a water tower ; the network is then supplied using the force of gravity. The advantage of taking water directly from a spring or the water table is that this water is generally potable and does not therefore need to be treated, which means fewer facilities are necessary and that reduces the cost. Water can of course be collected from a creek or a river, but in this case, the network will need to include a treatment step. In all cases, readers are invited to consult files E2, E3, and E3 bis concerning water adduction and making a spring a useable source, files E31 and E32 concerning drilling and files E40 and E41 concerning motorised and solar-powered pumps. Readers may also find interesting things in files E19, E21 and E23 concerning methods of treating water when it is necessary to take water from a stream. Depending on the topography of the terrain, this pipe can have a motorised pumping system attached. This reservoir, of a capacity ranging from 30 to 300m3 depending on the number of users in the network, will be placed at a height, such as with a water tower, to feed water into the network using the force of gravity. Its role is both to provide constant pressure in the system through its location and also to ensure availability of water permanently, in case of a temporary cut off in the original supply of water. Next, there is generally a simple water treatment system, for example sand filtration. The distribution network is essentially a series of pipes that can total up to some 30 km in all. The pipes used can be plastic (PVC or PET) or galvanised metal. - non-pressure pipes which are used for transporting water that is under no pressure. They should not be buried deeper than 20 centimetres. - pressure pipes which are classed by the amount of pressure that they can withstand (4, 6, 10, 16 or 25 bars). Lastly, the galvanised metal pipes are used in swampy areas or in places where it is impossible to bury pipes (over rock, through streambeds, etc). They are chemically treated not to rust. 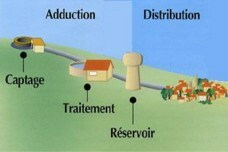 For more information concerning pipes, their maintenance and their installation, see the document “Adduction d’eau villageoise : manuel de fontanier” (“Water adduction in villages : a manual”), referenced at the end of this file. Standpipes should be installed in different neighbourhoods in such a way that residents need not go more than 250m to access one. Each one may include one or more taps and each tap can provide water for around 250 people. The local residents, and in particular the women there, should be consulted to determine where they should be placed. In some villages, the mini-network includes a few public connections to provide water for public places such as schools, a small health centre or toilets, as well as a few private connections if some families have the resources to pay for it until the system can be extended to more people, as standpipes are only a temporary solution and not ideal for providing water to an entire population, as was the case formerly in developed countries. Rural areas are not always on the electrical grid and so some mini village water works need a generator unit to provide electricity for the motorised pumps that provide pressure in the pipes. It is important to have spare parts on hand so that repairs can be made quickly when there is a breakdown that cuts off the water supply. Plan accordingly and have spares for the most fragile or critical parts. All water circulating through waterworks or pipes experiences “pressure loss” which depends on its speed and which needs to be properly estimated in order to create a network of the right dimensions. where V is speed, at a constant determined by the tables and g is gravitational acceleration equal to 9.81 m/s. But they have simplified things by providing graphs like the one on the right (1st column on the left = pipe diameter, 2nd = rate of flow, 3rd = speed of the liquid and the last one = pressure loss) which makes it easier to determine the value you need. 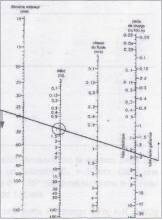 For example, using this graph, if we have a speed of 1 litre/second in a pipe with a 41 mm diameter, you simply need to join the two points on the graph with a straight line to find the pressure loss, which in this case is 1.7 m for 100 m of pipe. This graph also makes it possible to quickly determine the diameter needed for a pipe, larger if you want to decrease the loss of pressure. All you have to do is pivot the straight line in the direction of the arrows to read the new values. As indicated in paragraph 4.1, water taken directly from the water table (either after drilling a well or taking it from a spring) is generally potable without undergoing any particular treatment. However, when water comes from a lake, river or stream, it needs to be treated before it is distributed for drinking. If it is not, it can cause serious health problems. Access to good drinking water in the long term from a nearby source represents a real improvement in living conditions. This decreases the development of illnesses related to drinking unhealthy water (diarrhoea, cholera, etc.) and also removes the burden of fetching water. With a good water supply, children have a better chance of attending school and women save time to do other things. This system also creates jobs and involves the local population by including them in some of the work. This system does require the work of some specialists and a significant investment. It must also be regularly maintained. The cost of the various facilities depends first off on the geography of the area, the distance from the source or drilled well to the area to be served and the size of the population. The size of the reservoir is determined by all these factors, keeping in mind that 20 litres of water per person per day is the minimum requirement to meet essential daily needs and it is best to go beyond that minimum provision. Example from BURUNDI : the cost of installing a 6 km mini water network for collecting water from a spring with flushing chambers, reservoirs and standpipes was €47,700. The small maintenance costs are paid by the population through their participation of €0.07/m3 for those who have a connection and a flat fee for everyone else. The cost of the water distributed with this system includes : the cost of the personnel, loan charges, upkeep and maintenance, production costs which take into account the yield of the system (i.e. losses through leaks, spills, waste, etc.). Most often, water is paid for when it is used and depending on the volume, which fits with the local population’s lifestyle. For example, in KINSHASA, the production price for 1 litre of water is 1 Congolese franc and water is sold at a price of 1.50 Congolese francs, which covers all production costs as well as making it possible to establish a reserve fund which at the end of the year is reinvested in activities that benefit the neighbourhood. This file alone is not enough to make it possible for a group to install a mini village water distribution network and we strongly encourage any readers who are interested by this type of project to consult the documents given in the bibliography or cited in the text. Additionally, it is important to involve local populations in setting up this type of network so that residents feel concerned by its upkeep. 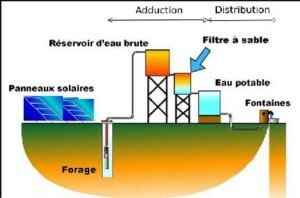 For example, in the case of networks set up with the assistance of the Belgian Development Agency, each mini network is managed by a Drinking Water Network Users Association (ASUREP, Association d’Usagers de Réseau d’Eau Potable) that is democratically elected in the neighbourhood served by it. In the Democratic Republic of Congo, the Belgian Development Agency assisted the installation of 60 mini-networks each one serving 5,000 to 35,000 people. In all, the programme served the water needs of 1.3 million residents and provided stable jobs for 1,600 people. The cost per person was €22 and the project will be paid for in 30 years. - PS Eau : “Adduction d’eau potable en milieu rural, guide des projets” (Adducting Drinking Water in a rural area, project guide) : this 50 page document presents the various steps to follow and provides useful information for carrying out a water capture project in a rural area, as well as advice for managing the facilities well.